Scariest: Entry #16: Rachel C. & Alison H.
A full collection of pumpkins is available on Cofrin Library’s Flickr account. 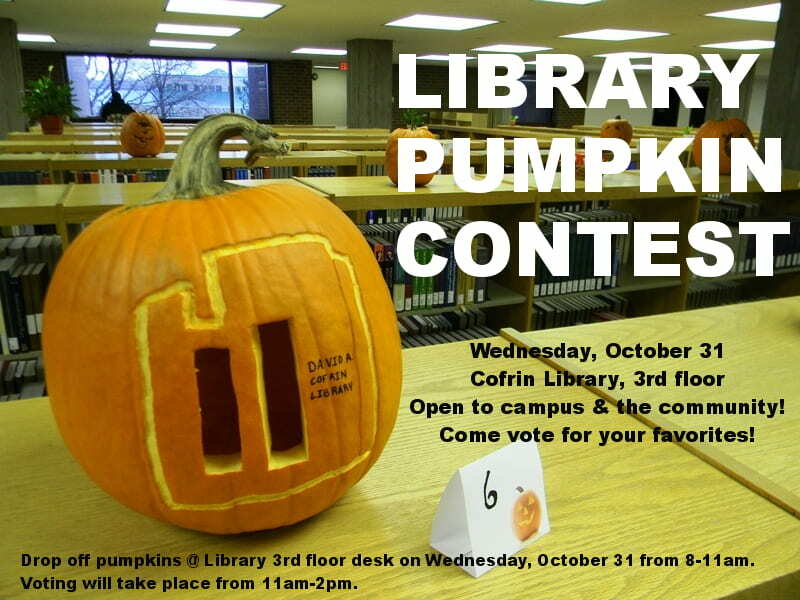 Calling all pumpkin carvers & decorators: Cofrin Library is hosting a pumpkin contest on Wednesday, October 31! We invite individuals and groups to submit an entry for our pumpkin contest. It’s open to the entire campus and community. Entries can be carved, painted, or decorated. You can also stop in and vote for your favorite pumpkins! To enter, just drop your pumpkin off at the Library’s 3rd floor desk on Wednesday, October 31 from 8am to 11am. Voting will take place from 11am to 2pm. Check out our Flickr set of library pumpkins from last year. If you have any questions, contact librarian Joe Hardenbrook at hardenbj@uwgb.edu or 920.465.2666.